Hilltops to find out who will be "the guy"
Cole Benkic was the CJFL's top defensive player in 2015. When you’re the venerable Saskatoon Hilltops, a mass exodus of players equals opportunity. The Toppers lost 16 players due to graduation from the Canadian Junior Football League championship squad from a season ago. A handful of others moved on to other teams namely in the Canadian Interuniversity Sport ranks. As head coach Tom Sargeant and the rest of his staff look at their newcomers and returning players, they have to feel a little excitement, because you wonder who in that group will be “the guy.” They have to know someone new or a returning backup is going to be “the guy,” and that person might not necessarily be someone you expect. Most of the Hilltops departing players were starters, but for a club that has won 18 national championships, rebuilding and reloading usually isn’t a very long process. The Toppers will be doing their best to be the first team to win six CJFL championships in seven years. The Hilltops are always strong when it comes to recruiting, so there is always the possibility a rookie will step in right away and make an impact. Quarterback Jared Andreychuk threads a pass down field for the Hilltops. Even with that in mind, the cupboard isn’t bare. Fifth year star quarterback Jared Andreychuk is back to lead the offence, and linebacker Cole Benkic, who was last year’s CJFL defensive player of the year, is back for his final season to guide the defence. Both will provide a steady influence on their respective units. Beast-type running back Logan Fischer returns for his fourth season, and fifth-year veteran receiver Tyson Sawatzky will be a key downfield target. On the defensive line, Blake Hermann and Tom Schnitzler are both back from a unit that was outstanding a season ago. They will likely once again cause grief for the quarterbacks of opposing teams. Besides containing Benkic, the Hilltops return some other strong linebackers in Cole’s brother, Adam Benkic, and Bobby Ehman. The secondary will be steadied by the leadership of James Vause, who will likely start full time at safety. The Hilltops will have to find a kicker due to losing Brett Thorarinsson to graduation, and he handled all those duties last season. Running back Logan Fischer powers his way up field for the Hilltops. As the season moves on, the Hilltops will improve due to having one of the best coaching staffs you will find on any team. Sargeant has lots of support behind him in the likes of defensive coordinator Jeff Yausie, offensive coordinator Sheldon Ball and special teams coordinator Matt Yausie. The Hilltops get things going for their 70th season as their main training camp opens on Monday at 1 p.m. at Ron Atchison Field. Their alumni game is set for Thursday at 7 p.m. at Saskatoon Minor Football Field, and they open the regular season on Aug. 14 at 1 p.m. at Saskatoon Minor Football Field against the Winnipeg Rifles. It is always fun watching the Hilltops play on a Sunday afternoon at SMF Field during summer and fall, and it be cool to see if they can add another chapter to their storied history. Will Rams versus Huskies draw at new Mosaic? QB Noah Picton (#4) and the Rams will open new Mosaic Stadium. The University of Regina Rams were successful in obtaining the right to host the first game at the new Mosaic Stadium in Regina, but you have to wonder if it will be the draw the Saskatchewan football community hopes it will be. On Oct. 1, the Rams host the University of Saskatchewan Huskies at 2 p.m. in the inaugural game at the new Mosaic Stadium called the SaskTel Fall Classic. Ticket sales for the contest will be limited to 16,500, but you have to wonder if that game will reach that lofty attendance total. Since the Rams joined the Canadian Interuniversity Sport ranks in 1999, they along with the Huskies have had various promotions to try and spike attendance for one game to the 10,000 mark, but have come up unsuccessful. Since 1999, the biggest crowd for a university level football game in Saskatchewan has been hosted by the Huskies, who crammed 12,567 spectators to the 2006 Vanier Cup at Griffiths Stadium. The host Huskies fell in that national final to the Universite Laval Rouge et Or 13-8. Going into the 2016 campaign, the biggest selling point of the Oct. 1 match between the Huskies and Rams is the fact they will be playing in Regina’s new stadium, which will be best known as the home of the CFL’s Saskatchewan Roughriders. The Rams are coming off a dismal and from accounts in Regina a dysfunctional 2015 season, where they were 0-8. Their attendance for their final two regular season home games at the old Mosaic Stadium were far from spectacular. On Oct. 17, 2015, the Rams drew 1,200 to their 49-46 loss to the University of Manitoba Bisons. The Rams closed the 2015 campaign drawing 1,100 to a 38-37 home loss to the Huskies on Oct. 30. Those figures are far from what the Rams drew during the days they had quarterback Darryl Leason, slotback Jason Clermont and running back Neal Hughes on their roster in 2000 when they appeared in the Vanier Cup and in 2001. Huskies RB Shane Buchanan hits a wall of Rams tacklers. The Huskies 2015 campaign fell short of pre-season expectations, and they almost missed the playoffs for the first time since 2000. Had the Huskies lost their Oct. 30, 2015 clash with the Rams, U of S would have missed the post-season. The Rams led that contest 34-11 late in the third quarter before the Huskies rallied for victory. Huskies fans usually follow their team down from Saskatoon to Regina for games, but U of S saw its home attendance slip during a 3-5 regular season campaign. In 2015, the Huskies season high in attendance came in a 33-18 victory over the Rams on a Sept. 18 clash at Griffiths Stadium with 6,476 spectators. The Huskies drew 4,254 spectators to a 44-15 loss on Oct. 16 to the University of Calgary Dinos and 3,179 fans to a 41-36 loss to the University of British Columbia Thunderbirds on Oct. 23. There is also a sizable minority among the Huskies supporters who heap piles of criticism on the team for going 1-10 in their last 11 playoff games, which includes a current seven game post-season losing streak. The notion that those supporters might make it to Regina to see the Huskies play is questionable. In Saskatoon, the Huskies receive the same level of scrutiny as a WHL team. Social media posts and press releases about the SaskTel Fall Classic keep saying tickets for the Oct. 1, 2016 clash between the Rams and Huskies are expected to go fast. That statement is highly doubtful. Personally, I would love to see the Rams and Huskies draw over 30,000 to SaskTel Fall Classic, but that is likely not reality. One thing that might boost attendance is making that clash between the Rams and Huskies a doubleheader with the CJFL teams from Regina and Saskatoon. The defending CJFL champion Saskatoon Hilltops are slated to be in Regina on Oct. 1 to take on the Thunder. That contest is set for 7 p.m. at old Mosaic Stadium, and obviously, starts after the Rams versus Huskies game is slated to finish. It might be prudent to get the Hilltops versus Thunder game moved to new Mosaic Stadium for a doubleheader and market everything as a football day in Regina. The chances of approaching an attendance figure of 16,500 would increase greatly if one had the chance to see all four of Saskatchewan’s post-secondary teams at one time. Marci Kiselyk smiles after scoring a TD. I was back in the Saskatoon Express this week with a feature story on Marci Kiselyk, who a star receiver for the Saskatoon Valkyries women’s football team. Kiselyk reflects on the Valkyries 2016 Western Women’s Canadian Football League championship campaign and the fact she has played for the Valkyries in all six seasons of their existence. She joined the Valkyries after playing five seasons with the University of Saskatchewan Huskies women’s basketball team. The feature led into the fact that Kiselyk will suit up for Saskatchewan’s provincial team for the inaugural Senior Women’s National Championship that is being put on by Football Canada right now in Regina. Saskatchewan will face Quebec in the event’s championship game on Sunday at 4:30 p.m. at old Mosaic Stadium. On Thursday, Saskatchewan blanked New Brunswick 58-0 in a semifinal match. Kiselyk caught nine passes for 171 yards and scores three touchdowns in the win. My Saskatoon Express story on Kiselyk can be found right here. Chris Schlenker will referee in the NHL. It is official, Chris Schlenker, who won the Allen Paradice Memorial Trophy this past season as the top official in the WHL, is heading to the NHL. CTV Lethbridge senior reporter Kaella Carr traveled to Medicine Hat to interview Schlenker, who is a member of the Medicine Hat Police Service, and he confirmed the news he has signed on to work in the NHL. He will take a leave of absence from the Medicine Hat Police Service starting at the end of August. Schlenker, who is from Medicine Hat, played in the WHL from 2001 to 2005 with the Regina Pats and Prince Albert Raiders. Carr worked for CTV Prince Albert, when Schlenker was a member of the Raiders. Both Carr and Schlenker were highly respected by the residents of Prince Albert during their time in that northern Saskatchewan city. Carr’s story on Schlenker heading to the NHL was outstanding. It can be found right here. Pats standout Hobbs is finding his way to "The Show"
Connor Hobbs is a star on the Pats blue-line. One day the Washington Capitals might look back on the 2015 NHL Entry Draft and admit they got a steal selecting Connor Hobbs in the fifth round. For about the last five years, Hobbs’ hockey career has been on a steady upswing. The 19-year-old defenceman was arguably the best Saskatoon product and possibly the best Saskatchewan product to play in the WHL last season. He became standout offensive defenceman piling up 19 goals and 22 assists in 58 games with the Regina Pats, while still remaining strong in the defensive zone. In 12 games in the WHL playoffs, Hobbs picked up 10 points coming on four goals and six assists. The Capitals selected Hobbs in the fifth round and 143rd overall in the 2015 NHL Entry Draft and prudently signed him to a three-year NHL entry-level contract on July 1st of this year. In what is turning out to be a memorable summer, Hobbs, who stands 6-foot-1 and weighs 196 pounds, is among the 41 players who have been invited to Hockey Canada’s national junior team summer development came, which starts Saturday and runs through to Aug. 6. The players take part in practices in Toronto starting Saturday and running to Aug. 2. From Aug. 3 to 6, the players will participate in series of exhibition games against national teams from Finland, Sweden and the United States in Plymouth, Mich.
Way back in 2012, Hobbs was selected by the Prince Albert Raiders in the fourth round and 67th overall in that year’s WHL Bantam Draft. He never played a game for the Raiders as his WHL rights were traded to the Medicine Hat Tigers before his 16-year-old season. Connor Hobbs brings the puck up ice for the Pats. Hobbs had a sound 15-year-old season as a rookie in the midget AAA ranks recording six goals and 10 assists in 38 games with the Saskatoon Blazers. He arrived in Tigers training camp in 2013 looking to crack a spot on a team that was loaded with veteran defencemen. The rearguard had an impressive camp, where he able to show off what has become his trademark point blast. The Tigers brass made the hard decision to send Hobbs back to the Blazers for his 16-year-old campaign. Hobbs took a big step forward collecting 11 goals and 12 assists in 33 games with the Blazers. He also appeared in 10 regular season games with the Tigers collecting a goal, two assists and a plus-one rating in the plus-minus department. In those games, Hobbs looked like he should be a WHL regular. During the off-season, those that saw Hobbs work out in Saskatoon could see he had a purpose to do everything he could to ensure he stuck in the WHL for the upcoming campaign. Connor Hobbs threads a pass in the offensive zone for the Pats. In August of 2014, Hobbs earned a spot on Canada’s under-18 team that won gold at the Ivan Hlinka Memorial Tournament co-hosted annually in the Czech Republic and Slovakia. Hobbs returned to the Tigers following that international event to start his 17-year-old season collecting a goal, an assist and a plus-one rating in 12 games. He was fighting for minutes on a defensive unit that was still heavy with veterans. As he was in his draft year, he did the smart thing for his situation and returned home asking for a trade. The talented rearguard played four games for the Nipawin Hawks in the junior “A” ranks and suited up for Canada at the World Junior “A” Challenge in Kindersley in December of 2014. The Pats acquired Hobbs on Jan. 5, 2015, and the Saskatoon product played lots of key minutes collecting a goal, 15 assists and a plus-five rating in 33 regular season games to finish the 2014-15 campaign. He did enough to earn his NHL Entry Draft selection from the Capitals. Connor Hobbs looks for an offensive zone opening. In the present moment, Hobbs has to be considered one of the best defencemen in the WHL. He has reached the point that he pretty much does everything right. He is the guy you want in the defensive zone controlling the puck and bringing it up ice to start an offensive rush. On the power play, he has become a skilled quarterback that really commands things and calmly sets in plays. On the defensive side, he can more than hold his own physically. Hobbs has put in the time, and he found the right opportunities to allow his career to progress. With the way he has progressed, there is no telling how good he can be, if the upswing in his game continues. With the Pats expecting to have a real strong team this coming season, Hobbs will likely be returned to the WHL ranks for his 19-year-old campaign, and he will definitely be a player to watch. WHL fans of any team would be to wise catch Hobbs in action while they still can. Kaitlin Willoughby is on Hockey Canada's radar. University of Saskatchewan Huskies women’s hockey team forward Kaitlin Willoughby is going to get the chance to see how she stacks up with Canada’s best. On Wednesday, Willoughby was one of 22 players from the Canadian Interuniversity Sport ranks to receive an invite to Hockey Canada’s Women’s Development Camp, which runs Aug. 5-14 in Calgary. For the CIS players, the camp provides an opportunity to turn heads in order to earn a roster spot for Canada’s women’s team that will play at the FISU Winter Universiade, which will run Jan. 29 to Feb. 8, 2017 in Almaty, Kazakhstan. The CIS players will take part in four games including two clashes against Sweden’s national team and two matches against players that are part of Hockey Canada’s women development program. The CIS players are eligible to be picked for Canada’s National Women’s Development team that will play in a three game series against the United States from Aug. 17 to 20 in Calgary. After graduating from the midget AAA ranks playing for her hometown Prince Albert Bears, Willoughby quickly attained star status with the Huskies. In the 2013-14 campaign, she was named the CIS rookie of the year after recording 10 goals and 15 assists in 28 regular season games. The speedy forward was a key contributor in helping the Huskies win their first ever Canada West title during her rookie campaign. Willoughby permanently carved her place in the history of the Huskies women’s hockey team in the 2014 best-of-three Canada West championship series against the University of Regina Cougars. In a series deciding Game 3, Willoughby potted the double overtime winner to give the Huskies a 2-1 victory at the ancient Rutherford Rink. Kaitlin Willoughby has piled up the points in three seasons with the Huskies. During her three seasons with the Huskies, Willoughby has collected 30 goals and 41 assists in 82 regular season games. The always pleasant and upbeat 21-year-old has also built a reputation for being loved by her teammates and a large number of players from the other U of S Huskies teams. Willoughby has more than earned her chance to get on Hockey Canada’s radar. With that said, the CIS players will be in tough to earn a chance to play on Canada’s National Women’s Development team that will play in a three game series against the United States. The women’s development camp contains 42 players that are part of Canada’s women’s development program including Saskatoon product Emily Clark, who is already a member of Canada’s senior national women’s team at age 20. Clark is a gritty star forward with the storied and powerhouse University of Wisconsin Badgers of the National Collegiate Athletic Association. From Aug. 7 to 14 in Calgary, Hockey Canada will also host a selection camp for the under-18 women’s national team. The under-18 camp contains 43 players including defender Willow Slobodzian and forward Mackenna Parker, who are both star players for the Saskatoon Stars. The Stars have won the last two straight Saskatchewan Female Midget AAA Hockey League titles. Both Slobodzian and Parker reside just outside of Saskatoon in Clavet. The camp also includes Saskatoon products and forwards Nara Elia and Sophie Shirley. Shirley was a member of Canada’s under-18 team last season. Both spent last season with the Notre Dame Hounds team that plays out of the Junior Women’s Hockey League. Defender Brooke Hobson from the Prince Albert Bears rounds out the Saskatchewan players invited to the under-18 camp. The circle "S" logo on retro uniforms brings bad luck. The Roughriders took the field for the Labour Day Classic that day sporting their classic green uniforms with the two white arm stripes on each shoulder and green helmets showing off their traditional circle logo with the “S.” Unfortunately, there was one noticeable difference a superstitious fan would notice about the retro look in this game that was unsettling. 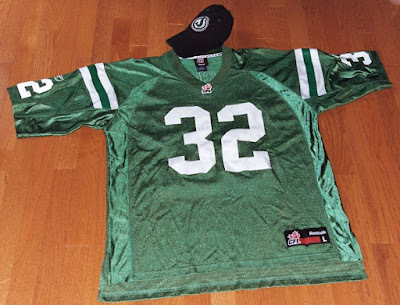 When the Roughriders first brought back these classic retro uniforms in the 2007, they were looking to mirror a look the team had from the late 1960s through the 1970s during the glory days of when Ron Lancaster quarterbacked the club and George Reed powered the team on the ground at fullback. 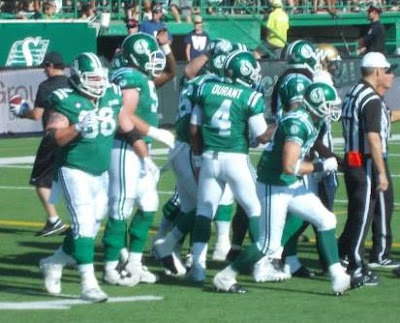 In a match that was a tribute of that era, the Roughriders wore those throwbacks in the 2007 Labour Day Classic, where quarterback Kerry Joseph ran in the game-winning touchdown from 27 yards out in the final seconds to give the Green and White a thrilling 31-26 victory over the Winnipeg Blue Bombers. The retro uniforms the Roughriders wore in 2007 did not contain a team logo and sported each players’ number on the sleeve of the upper arm. This look was widely recognized as the club’s 1970s look, and the Roughriders often wore these throwbacks for special occasions in the regular season and key games in the post-season. That included crushing the Blue Bombers in the 2012 Labour Day Classic 52-0. When those uniforms were brought back as alternates 2007, the Roughriders went on to make four Grey Cup appearances, which included wins in 2007 and at home in 2013. Unfortunately, there was a change in the look of these retro uniforms in the 2014 Labour Day Classic. The numbers on the sleeve on the upper arm were replaced with the classic circle logo with the “S.” The numbers were moved to the shoulder area. The retro uniforms with no logo and numbers on sleeve bring good luck. With those subtle moves, the retro uniforms went from bringing back memories of the glory era of Lancaster and Reed to bringing back memories of the “Reign of Error,” when the Roughriders missed the playoffs for 11 straight years from 1977 to 1987. The Roughriders wore their classic green uniforms complete with the circle “S” logo on the sleeve on the upper arm through most of that unsuccessful span. That look is viewed as the look of the unsuccessful era of the early to mid-1980s. While wearing that look, the Roughriders once got bombed 56-0 by the Blue Bombers in Winnipeg on July 5, 1986. For all intents and purposes, that look is a cursed look. 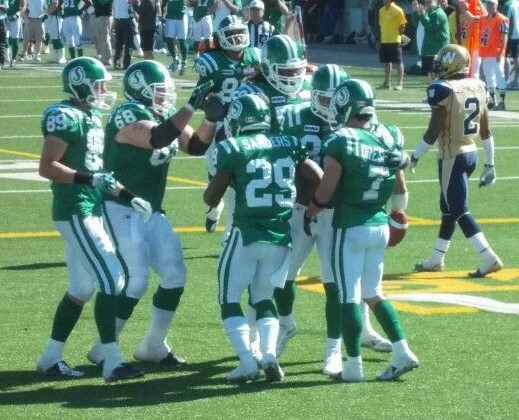 The cursed look didn’t bite the Roughriders right away, when they wore the retros with the circle “S” logo for the 2014 Labour Day Classic. In a thriller, Roughriders running back Anthony Allen delivered the hosts to a 35-30 victory over the Blue Bombers with a major in the last seconds. Saskatchewan improved to 7-2 with that victory. While the Roughriders don’t wear those uniforms all the time, the superstitious fan saw the door open to allow a string of bad things to fall the Roughriders way. The Roughriders retro jerseys with circle "S" logo on sleeve are cursed. The curse struck in the team’s very next game on September 7, 2014. The Roughriders downed the Blue Bombers in Winnipeg that day 30-24 to improve to 8-2, but Saskatchewan lost franchise quarterback and Grey Cup hero Darian Durant to injury. He tore a tendon in his right elbow. That injury occurred when the officials didn’t blow a play dead with certainty in a loud Investors Group Field, which saw half of the players stop and half continue on the play. Bombers defensive end Bryant Turner continued with the play and nailed Durant to cause the injury. Since that game, the Roughriders have posted an unspectacular 5-25 record including regular season and playoffs. Durant returned for the regular season opener in 2015, but he was lost before halftime after rupturing his left Achilles tendon shortly before halftime on a non-contact play. He missed the rest of the 2015 campaign, which saw the Roughriders sit in the basement of the CFL with an awful 3-15 mark. In the Roughriders 0-3 start in 2016, Durant played the full first two games before leaving Saturday’s 40-27 loss to the B.C. Lions at Mosaic Stadium in the second quarter due to a severe left ankle sprain on a low hit. The Roughriders were ahead 10-7 when Durant left and were even up 23-10 at halftime before the wheels fell off. These Roughriders classic retros with no logo should always be worn. During most of the 25 losses the Roughriders have suffered in their last 30 games, they have usually fallen in some sort of heartbreaking fashion. It seems the team can’t get a break. When they decide to wear throwbacks, they usually turn to their classic green uniforms with the circle “S” logo. The purpose of having the team logo on a uniform helps cement brand recognition. Unfortunately in the case of the Roughriders retro uniforms, it brings back the stench of a bad era, when the team almost folded. To make things clear, the Roughriders classic retro throwbacks with the circle “S” logo on the upper sleeve of the jersey are cursed, and they cause the team to be cursed when in use. The Roughriders classic retro throwbacks with no logo and the players’ numbers on the sleeve of the upper arm are good and lucky. Saskatchewan needs wear this retro look from here on out to no longer be cursed. That is my thought process, and I am sticking to it. If you have any comments you would like to pass along about this kind of irrational fan-type post, feel free to email them to stankssports@gmail.com. Schlenker going to "The Show?" Chris Schlenker waves off a goal in the WHL playoffs. It appears the WHL won’t have the services of its award winning official this coming season. Last season, Chris Schlenker won the Allen Paradice Memorial Trophy as the WHL’s top official. On July 7, Scoutingtherefs.com reported that the Medicine Hat product was one of four officials hired by the NHL. A day later, Hockey Alberta sent out a release stating Schlenker was making the jump to the NHL. The NHL itself has yet to officially confirm any new referee or linesmen hires. Unlike player, coach and general manager signings, referee and linesmen hires barely register as a blip on the radar for most hockey fans. Those that care about that kind of news are usually the family and friends of an official. The 32-year-old has always been popular in his hometown of Medicine Hat, and when he skated as a defenceman with the WHL’s Regina Pats and Prince Albert Raiders from 2001 to 2005, his popularity expanded in the hockey world in Western Canada. On the ice, fans loved the hits Schlenker dished out. Standing 6-foot-2 and weighing 198 pounds, he was a rock solid and tough defensive defenceman. Off the ice, he built a reputation as being a solid team guy serving as the Pats captain and as an assistant captain with the Raiders. When the Pats traded Schlenker in early January 2004 to the Raiders, his departure was greeted with sadness in Regina. When he arrived in Prince Albert, there might never have been player that was welcomed right away and greeted so warmly into the Raiders dressing room. In 284 WHL regular season games, Schlenker collected 25 goals, 67 assists and 718 minutes in penalties. After his playing days wrapped, Schlenker settled back in Medicine Hat to raise his family and pursue his career in policing. While his hockey playing days were over, his days in the game were not. 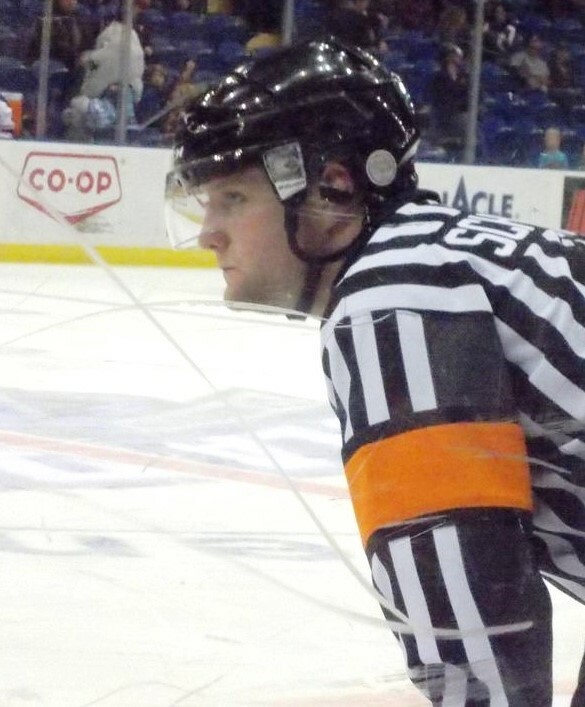 Veteran referee Chris Savage, who had storied career wearing the striped shirt, had also settled down in Medicine Hat to pursue a career as a firefighter with the Medicine Hat Fire Department. Savage got to know Schlenker and recruited the steady rearguard to return to competitive hockey as an official. Chris Schlenker keeps tabs on the action on the ice. Savage thought that Schlenker would be a natural as a referee after playing the game for an extended time at a high level. If Schlenker applied his gritty work ethic towards officiating like he did his hockey playing career and his policing career, there was no telling what doors might open for him. Schlenker contemplated the decision for an extended time, before becoming a hockey official about five years ago. He quickly worked his way up the officiating ranks. By the time he was skating in his third season as a referee, Schlenker was in the WHL on a full-time basis. The games he worked always seemed to have a nice flow to them. He let the soft calls that didn’t have an effect on the game go, and he always got the major ones right. He mastered the skill of communicating well with the coaches and players on both teams in the games he worked. As a former player, he often was able to spot times when tensions were about to escalate, and he was able to put out fires before they happened. Schlenker was professional and detailed when it came to watching game film and working with officials supervisors with regards to positioning on the ice and making the correct calls in muddy situations. He was making the effort to master the craft of being a referee, which takes a lot more commitment than most in the public realize. At the WHL level, most coaches and general managers that saw Schlenker play respected him for the work he did on the ice as a blue-liner. When Schlenker returned to the WHL as a referee, he earned a new respect from players, coaches and general managers for his efforts as an official. After Schlenker started working some assignments in the American Hockey League this past season, there were a lot of people in the WHL hoping he would get an NHL shot. A lot of Schlenker’s teammates from his Pats and Raiders days were sad the Hat product didn’t get a chance to be part of “The Show” as a player. Everyone that knows Schlenker will be pumped to see he found another way to make it to the top. While most of Schlenker’s assignments next season will likely be in the AHL, his eventual NHL debut will be a dream come true. The party starts for the Roughriders win in the 2013 Grey Cup in Regina. 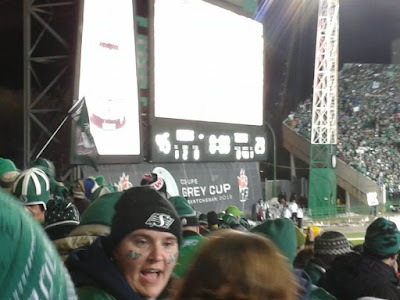 Every time I step inside Mosaic Stadium in Regina I still see images of that chilled Sunday night on November 24, 2013. That of course is the night the Saskatchewan Roughriders won the Grey Cup at home with a 45-23 stomping of the Hamilton Tiger-Cats. I can still see the people that were around me in the stands of the north end zone as we stood and watched that whole contest. I can feel heat from the pyro pots from Hedley’s performance at halftime. On the field, the images of a fumble by Roughriders quarterback Darian Durant going high in the air and getting pulled down by teammate and running back Kory Sheets is still there. Sheets rumbled off a magical 39-yard gain. You can see him running with power and authority piling up a game record 197 yards and two touchdowns. Geroy Simon’s crazy diving touchdown catch that occurred just under me in the north end zone is also burned in my mind. It helped give the Roughriders a 7-3 lead in the first quarter. I can also see Tiger-Cats quarterback Henry Burris coming unglued due to the relentless pressure of rush end John Chick and the Roughriders defence backed by the noise of the 13th Man. You can still feel the frenzy in the crowd as the clocked ticked to zero and people were hugging their neighbours all around them. That image of Durant hoisting the Grey Cup with a huge smile will also live on forever. At times, you would expect following an event on a television, a live stream or checking various updates on social media is as good as being there. It isn’t. When you are actually there for the Roughriders only home Grey Cup win, it is something that is beyond the bucket list. You have a better appreciation for the moment. In sports, it is always better to be there and soaking in the moment and being unplugged from everything else. It is something television, the Internet and social media streams can’t duplicate. Enjoying the magic of being there is something the Saskatoon based Saskatchewan Rush lacrosse team has mastered. All nine of their regular season home games were a party. When the cold winter days of January turned into the warm spring nights of May for playoffs, the experience of being there took another couple of big jumps. Before the Rush’s last two playoff games, people were out enjoying the day tailgating outside the SaskTel Centre. Inside during game time, it was a rock and roll atmosphere. The best night by far was of course Saturday, June 4, when the Rush captured the National Lacrosse League championship. Sitting in the SaskTel Centre, I could feel the heart pumping as Rush forward Mark Matthews opened the game’s scoring with an incredible diving goal. One will never forget the delirium that ensured when Rush defenceman Jeff Cornwall scored the winning goal on a breakaway with 12 seconds to play in the game breaking a 10-10 tie to give the Rush an 11-10 victory. The crowd at the SaskTel Centre roared like they never have before, when Rush captain Chris Corbeil raised the Champion's Cup. The appreciation for being there can also be felt in following an amateur squad like the Saskatoon Stars midget AAA girls hockey team. The Stars two biggest wins came on the road, backed by a healthy contingent of family and friends that followed them. The Saskatoon Stars celebrate an SFMAAAHL title win. On March 26 in Swift Current, the Stars claimed a second straight Saskatchewan Female Midget AAA Hockey League championship with a 4-3 overtime victory over the Diamond Energy Wildcats. Being at the Fairview Arena that night, I can still see young 14-year-old forward Grace Shirley blasting home the winner at 4:08 of the extra session. Her goal celebration was of NHL caliber with her Stars teammates piling on top of her. A week later on April 2, I was in Shoal Lake, Man., when the Stars claimed the Western regional title with a 3-1 victory over the host Yellowhead Chiefs. I can still see the focus of Stars goalie Emma Johnson as she made save after save, and the joy of 18-year-old defender Rayah DeCorby, who wired home the game winner from the point with 6:41 to play in the third. Feeling the enthusiasm of the Stars players after both those banner winning games was priceless. In Canada’s shrinking mainstream media, there is less and less emphasis on being there for big sporting moments. Outlets basically hope these big wins happen in the centres they are located in. The emphasis of capturing what it felt like to see these moments unfold in person is a lost art, which is too bad. Events at the professional level outside of the NHL in all reality aren’t covered like they used to be, and amateur events are at times hardly covered at all including national championships. When you are there in person, you realize what is being missed. For me, one of my greatest sports memories always flashes before my eyes every time I step inside The Arena in Medicine Hat, which was the Medicine Hat Tigers home rink for their first 45 seasons of existence. My Medicine Hat News story of the Tigers 2007 WHL title win. I was there on May 14, 2007 when Brennan Bosch scored his famous double overtime winner to deliver the Tigers to a 3-2 Game 7 victory in that year’s Western Hockey League championship series against the Vancouver Giants. Bosch had the puck near the blue-line in his own zone, and he was tapped by a swinging stick of a Giants player. The Tigers talented centre went down to his knees, quickly got up and a 3-on-1 break ensued. The Martensville, Sask., product skated two to three strides past the Vancouver blue-line and wired home the winner low stick side on Giants goaltender Tyson Sexsmith. The sellout crowd of 4,006 spectators exploded like they never did before. I remember taking the time to be in awe of what I saw soaking in the experience. Nothing truly does beat being there. If you have any comments you would like to pass on about this blog post, feel free to email them to stankssports@gmail.com. Darian Durant sets to throw a pass at Roughriders training camp in 2015. Darian Durant’s presence on the field gives the Saskatchewan Roughriders hope that 2016 has the potential to be more than just a rebuilding year. On Thursday night, the Roughriders star quarterback played his first full regular season game from start to finish in about 20 months. Before Thursday night, the last time Durant started and finished a game came back on August 31, 2014, when the Roughriders pulled out a thrilling 35-30 victory over the Winnipeg Blue Bombers in the annual Labour Day Classic at Mosaic Stadium. In Saskatchewan’s next game on Sept. 7, 2014, Durant tore a tendon in his right elbow in a 30-24 victory over the Blue Bombers in Winnipeg. The injury sidelined him for the rest of that campaign. He returned for the 2015 regular season opener at Mosaic on June 27. Shortly before halftime, Durant ruptured his left Achilles tendon throwing the ball on a play where he wasn’t contacted. He was lost for the rest of that season, and the Roughriders lost that game 30-26 to the Blue Bombers and stumbled into the basement of the CFL with a 3-15 record. Darian Durant lies injured on the Mosaic Stadium turf on June 27, 2015. Before those two big injuries, Durant has cemented himself as a Roughriders legend guiding the team to a Grey Cup championship at home in 2013 and Grey Cup appearances as a starter in 2009 and 2010. He was also part of the Roughriders 2007 Grey Cup championship team as a third stringer. Going into the 2016 season opener, Rider Nation was unsure what they would see, when Durant took the field at Mosaic against the Toronto Argonauts. The Florence, South Carolina, product turns 34 on August 19, so age is starting to become a concern. After going such a lengthy stretch since last playing a full game, one had to wonder if Durant could still be a star signal caller. Plus, the Roughriders had a new coaching staff and turned over about two-thirds of their roster from the 2015 campaign. Actually, very few players remain with Saskatchewan from the last time Durant started and finished a contest in 2014. Darian Durant fires a pass downfield training camp in 2015. Against the Argos on Thursday night, Durant looked like himself. He completed 31 of 48 passes for 310 yards, one touchdown and no interceptions. Had it not been for a number of dropped passes, Durant could have eclipsed the 400-yard mark through the air. The Roughriders ultimately fell 30-17, but there was a pre-game fear the score of the first contest with Durant back under centre could have been more lopsided in favour of the opposition. Toronto claimed victory thanks to a couple of breaks. First, they were set up at the Saskatchewan five yard line thanks to a long punt return, which allowed Argonauts quarterback Ricky Ray to throw a short TD toss to slotback Audre Durie early in the first quarter. Second, Roughriders backup quarterback Bryant Moniz fumbled the ball away on a short yardage third down gamble in the second quarter, which allowed Argos defensive back Matt Black to return the ball 27 yards for another major score. That score allowed the Argos to go ahead 21-7. Despite those big plays from the visitors, Durant was spreading the ball all over the field showing he has a good handle on the system new head coach Chris Jones and his staff have implemented. You started to think Durant might rally the Roughriders all the way back like he had done on numerous occasions in the past. In the end, too many drives stalled out resulting in field goals during the comeback attempt. Still, Durant inspired hope that he might be the wildcard in the Roughriders fortunes in 2016. Durant’s play brought back memories of his first CFL start way back on July 12, 2008, when he threw the Roughriders to a thrilling 33-28 road victory over the Tiger-Cats in Hamilton. You also remembered his amazing five touchdown pass performance in a spectacular 54-51 double overtime victory over the Montreal Alouettes in the 2010 season opener on July 1 at Mosaic. He also had three classic performances in the 2013 playoffs helping lead the Roughriders to a Grey Cup championship. Darian Durant calls signals for the Roughriders on Thursday night. Actually, it would be easy to create an NFL style top 10 style list of the best Darian Durant games from his time in Rider Nation. Expectations aren’t high this season for the Roughriders. A lot of fans expect the club to finish the campaign with a losing record. Durant is the best quarterback the Roughriders have had since the iconic Ron Lancaster retired following the 1978 season. As the current campaign progresses, Durant will develop a higher comfort level with a group of receivers he hasn’t worked a lot with outside of veteran Rob Bagg. It would not be a surprise if Durant creates new entries to his list of top 10 best games. With Durant at the controls of the Roughriders offence, he creates belief that the team has a chance to win on any given night and that the 2016 campaign won’t be a lost cause.